Ho Chi Minh or Saigon is nestled on the banks of the Saigon River, Vietnam`s largest city with a rich cultural heritage boasting classic French colonial architecture, incense-infused temples, ornate pagodas and sleek modern skyscrapers this spectacular city offers so much to be discovered. Wander the tree line boulevards and streets filled with markets and delicious street food. 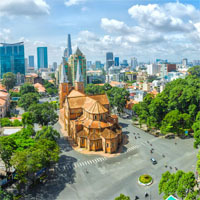 Marvel at the historical buildings such as Saigon Notre Dame Basilica, the Central Post Office, and Ho Chi Minh Square. Reunification Palace, Central Post Office, Saigon River, Saigon Notre Dame Basilica, Vinh Nghiem Pagoda, Jade Emperor Pagoda, War Remnants Museum, Fine Arts Museum and so much more! Hanoi is the political capital of Vietnam and the cultural center of the country boasting museums, monuments, and relics. This beautiful capital city is filled with serene lakes and surrounded by spectacular mountains decorated with ancient temples and pagodas. The ancient streets of the Old Quarter are filled with delicious street side food vendors, shops and popular markets with motorcycle taxis whizzing in every direction. 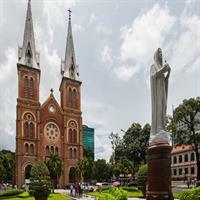 Visit this spectacular city boasting old French colonial architecture and discover the deep Vietnamese history that lies in the city`s districts. Ho Chi Minh Mauseloum, One Pillar Pagoda, Presidential Palace, Imperial City of Thang Long, Flag Tower, Hao Lo Prison, Bach Ma Temple, Dong Xuan Market and so much more! Hue is a place of great beauty and the most important historical and cultural monument in Vietnam, an UNESCO World Heritage Site. The beautiful Song Huong or Perfume River flows through the centre of this former imperial city, and along its banks south of Hue lays the Valley of the Kings containing tombs of the Nguyen emperors. The city of Danang is one of the most popular beach destinations in the country. The chain of iconic Marble Mountains and the tranquil verdant countryside are more of this magnificent city`s attractions. In Danang visitors can explore museums, temples, archaeological ruins and sprawling national parks. Sample some of the best street food around and shop at the bustling local markets. Go surfing on My Khe, the most luxurious beach in the world or play golf at one of the four world class courses. There is something for everyone in this authentic ancient city. Marble Mountains, Cham Museum, My Khe Beach, Con Market, Troung Son Mountain, My Son Sanctuary, Linh Ung Pagoda, Dragon Bridge and so much more! Phu Quoc is a Vietnamese island off the coast of Cambodia in the Gulf of Thailand. Fringed with white-sand beaches, luxury hotels, resorts and excellent seafood, rapidly became one of the South East Asia’s top holiday destinations. Still, there are areas for exploration and escaping, diving and kayaking. The UNESCO World Heritage Site of Hoi An is an ancient trading port of Southeast Asia featuring well-preserved buildings and noteworthy monuments. This attractive riverside town offers visitors a charming blend of local and foreign influences with lantern-lit streets, bustling night street markets, rows of shop houses filled with famous tailor-made outlets. Hoi An is a foodie`s haven serving up delicious street food and traditional Cao Lau (Pho) and ‘Bahn Mi’ the Vietnamese sandwich. Visit the beautiful beaches and the idyllic Cham Islands or travel to the ruins of My Son. Traveling to Hoi An during the Full-Moon Festival (the 14th day of each month) is quite the experience when the city lights are shut off and colorful lanterns sparkle into the night. Tra Que Village, My Son ruins, Cua Dai Beach, An Bang Beach, Precious Heritage Museum, Assembly Hall of the Fujian Chinese Congregation, The Museum of Trade Ceramics, The Tan Ky House, Japanese Covered Bridge, Ancient Town and so much more! Ho Chi Minh City, `Saigon` is the largest city in Vietnam and was once known as the `Diamond of the East`, the financial, business and economic core of the country. An exuberant metropolis boasting a deep history of war and a fascinating culture that can be uncovered down ancient lanes and alleyways filled with street markets, cafes and food stalls selling delicious authentic Vietnamese cuisine. This exhilarating city is spread throughout many districts featuring a vibrant nightlife scene, world class cuisine, temples, spectacular shopping and the world`s strongest coffee. Visit the many museums, temples, and monuments, shop at the street markets, savor the exquisite cuisines and cruise along the Saigon River. 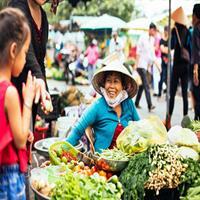 Explore Vietnam in depth! Combine Ho Chi Minh, Hoi An, Hue, Hanoi, Halong Bay and Hanoi. Highlights of Vietnam... Visit Ho Chi Minh with its many modern skyscrapers, amidst Chinese style pagodas and food stalls along the street. Then fly to the marvelous city of Hanoi, which is considered one of the main cultural centers of Vietnam. 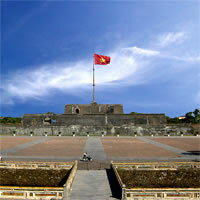 Lastly, explore the French-colonial city of Danang. This resort town is located just 24 miles away from the famous Ba Na Hills and its Golden Bridge. Cambodia, Vietnam and Thailand; unforgettable vacation experience! Visit the fascinating city of Ho Chi Minh, Vietnam's largest city and its most important economical and cultural trade centre. Then fly to Hanoi, consider one of the most beautiful cities in all Asia. Continue to Siem Reap, where you will find museums that will take your breath away, or traditional Apsara dance performances that will give you a taste of the classical Khmer culture. Last but not least is Bangkok, the capital and most populous city of Thailand, where you can marvel at the gleaming temples, catch a tuk tuk along the bustling Chinatown or take a longtail boat through floating markets among other activities. This is a flexible vacation in Cambodia, Vietnam and Thailand with daily departures from anywhere in the USA or Canada. Choose your length of stay. Pick your own flights, hotels and activities. Add, remove or reorder cities. From Temples to Skyscrapers... Fly to the lively and spirited city of Ho Chi Minh, a place that features The Jade Emperor Pagoda; a religious place that is considered to be one of the most spectacularly atmospheric temples in this City. Then explore Hanoi and discover the picturesque and delightful Hoan Kiem Lake, which is one of the major scenic spots in the city and serves as a focal point for its public life. Up next fly to Singapore, where their rich culture, exciting adventure, fine arts and delicious cuisine are blend all together to offer you a stupendous experience. Incredible Indochina... Spend you vacations eating Pho-noodles or drinking Vietnamese coffee at any one of the many pop-up cafes in Ho Chi Minh. Then relax and tan at Nha Trang, a city known as the beach capital of Vietnam. Finally, fly to Siem Reap and explore 'Angkor Wat', the central feature of the Angkor UNESCO World Heritage Site containing the magnificent remains of the Khmer civilization. Handcraft and Cuisine cities... There is a lot to do in Ho Chi Minh; you can lose yourself at Ben Thanh Market marveling at local handicrafts, textiles, and ao dai, this is definitely a pulsating place that is always busy; you'll feel its magic for sure! Up next is Singapore, the perfect place to spoil yourself with some Chinese treats at Chinatown, go for indian flavors at Little India or even experience its Malay/Arab cuisine tasting some of their delicious seafood, including the famous chilli and black pepper crab. Fantastic Indochina + Singapore! If you are looking for relaxation and excitement, all in one, then come to Ho Chi Minh; commonly known as Saigon and visit their internationally known Jade Emperor Pagoda, which is one of the most spectacularly atmospheric temples of this area. Up next fly to Siem Reap, a strikingly memorable place that will take you back on time and offer you a pick of the ancient Khmer civilization thanks to their many Angkor temples. Last but not least fly to Singapore and explore some of its iconic places of worship and get to know their multicultural blend of fabrics. Legendary and Modern cities... Fly to Ho Chi Minh, the once dearly called Diamond of the Far-east and see its Reunification Palace, definitely the place to visit for its significance and archival of Vietnam War. Next fly to Hong Kong, known for its expansive skyline and deep natural harbor, where vestiges of Chinese clan heritage and European colonial history sit side by side. Just a delight for your eyes! Amazing Vietnam and Hong Kong... Start your vacation in Ho Chi Minh exploring the famous Cu Chi Tunnels, an amazing underground labyrinth from which the Vietnamese fought during the American/Vietnam war. Then fly to Hoi An, recognized as a World Heritage Site by UNESCO for being a well-preserved example of a Southeast Asian trading port, with buildings that display a unique blend of local and foreign influences. The trip continues in the astonishingly beautiful Hue, where the Imperial City is a must see due to its grandeur. Along the trip you will visit Hanoi, which is considered to be one of the most beautiful cities in all Asia thanks to its tree-fringed lakes and ancient pagodas. Last but not least is Hong Kong, this enigmatic city of skyscrapers, ancient traditions and heavenly food will make you want to stay there for life! Cities and Temples! Fly to the beautiful Hanoi and get busy!, touring between their many temples and museums, where ancient and proudly preserved Vietnamese culture is felt most keenly by visitors. Then fly to the lively and spirited city of Ho Chi Minh, a place that features The Jade Emperor Pagoda; a religious place that is considered to be one of the most spectacularly atmospheric temples in this City. This is a flexible Vietnam vacation package with daily departures from anywhere in the USA or Canada. Choose your length of stay. Pick your own flights, hotels and activities. Add, remove or reorder cities. Temples and Asian Cuisine at its best. Astound yourself visiting Hanoi, where a fascinating blend of East and West, combining traditional Vietnamese motifs with French flair offering visitorsa marvelous experience. Then fly to Ho Chi Minh, commonly known as Saigon and visit their internationally known Jade Emperor Pagoda, which is one of the most spectacularly atmospheric temples of this area. Up next fly to Singapore and unbutton your belt because this is the perfect place to indulge yourself with some Chinese treats at Chinatown, go for indian flavors at Little India or even experience its Malay/Arab cuisine tasting some of their delicious seafood, including the famous chilli and black pepper crab. Combine Siem Reap and Ho Chi Minh City (Saigon) with flights between cities. Bangkok + Vietnam! Explore Bangkok, famous and appreciated by visitors for its versatility and multiple attractions such as temples like The Grand Palace or 'Chatuchak', the largest shopping center and largest outdoor market in Asia. Then fly to the energetic Hanoi, a city that is considered one of the main cultural centers of Vietnam, and visit their prominent Temple of Literature or their many museums around the city. Next, fly to Ho Chi Minh, which is Vietnam’s most lively and joyful city. All the temples and museums, in addition to the beautiful views of this city will definitely make a great impression on each visitor. Clearly a must see! Combine the most popular cities of Vietnam. 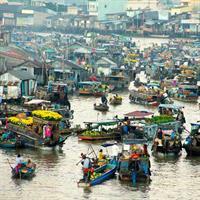 Travel to Ho Chi Minh - The largest city in Vietnam. Then take your flight to Hoi An which it's recognized as a World Heritage Site by UNESCO. Take a flight to Hanoi, the capital to Vietnam. Last but not least, board a luxury cruise to enjoy the beautiful Halong Bay. **Important ** This package valid for minimum and maximun 2 passengers per cabin. I am very satisfied with your support and service. I plan to use your again. I can't offer suggestions for improvement. We have no complaints. Keep it up.